Invasion of the Boxelder Bugs!!! After an especially cold week of lows in the single digits, the temperatures suddenly soared into the low 60's today! You gotta love wintertime in the Southeast! I got the urge to go out and see if I could find any insects to photograph. Sometimes on a warm winter day some adult insects will emerge from their winter hiding places. I took a walk in the woods near our house, no insects were to be seen. As I walked behind our house I saw a Ladybug crawling on the siding, that was no surprise. The rear of our house faces the south, so it is much warmer. Suddenly, I saw a large black mass in the corners of the concrete steps leading to the back door. Well, I got my wish, I found some insects... hundreds of them! They were warming themselves on the wall and steps. Tonight I took my 4-1/2'" Celestron telescope out to the end of our street to look at the nearly full moon. I found my viewing scope was out of whack and it made finding even the moon a challenge. Then, once I managed to find the moon, it was too bright to see many details of the craters. So I turned the scope to the west to look at Venus. This beautiful planet is the third brightest object in the sky. Last night I had tried to photograph it with my spotting scope, to no avail. What a nice surprise I got when I looked at Venus through the telescope and saw it was in the crescent phase! If it had been a "full Venus" it would have been very bright. Unfortunately, I was not able to get a picture of it because I don't have a telescope adapter for my camera (yet!). At 10:15 p.m. I took the telescope back out on the road (fortunately, we live on a dead end street) to try and find Saturn. It was just high enough to see it pretty well. The street light behind my shoulder made looking through the telescope even more challenging, as if an "out of whack" viewing scope wasn't bad enough! If I cupped my fingers around the eyepiece I could cut out most of the glaring light. The rings of Saturn are seen edge-on now, so they were very thin. Even though my telescope is not particularly powerful, I was able to see (what I assume was) Titan, Saturn's largest moon. It looked like a tiny pinpoint of light. Next I found the constellation Orion and its nebula in the "hunter's sword". It looks like a fuzzy cloud with 3 stars inside. Fortunately, the bitter cold weather gave way to a bit warmer temperatures today, so it wasn't too bad outside tonight. Wintertime is a great time to go star gazing, the skies are much clearer and the stars can be seen earlier in the evening. photographed. I guess the practice is starting to pay off! These are the best photos I've yet taken of snowflakes. I took these photos with a 105mm macro lens on my Nikon D80. 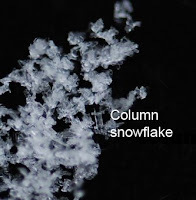 These are dendrite snowflakes, they are very different than the hollow columns I took photos of yesterday. This type of snowflake forms when the temperature in the clouds is 3 - 10 degrees F. I hope it will snow at least one more time this winter so I'll have another chance to take more photos! It was raining when I went to school at 8:00 this morning. By 9:00 a.m. there were big "juicy" goosefeather-type snowflake clusters coming down. Needless to say, the kids were very excited! After yesterday's high temperature of 61 degrees (F), I didn't expect it to stick to the road, but at 10:30 the principal announced that school would be closing at 12:30 p.m. I couldn't wait to get home and try out my new snowflake photography experiment. Last week I bought 1/2-yard of black velvet and mounted it on a piece of cardboard so I can catch snowflakes. The good news is, the velvet worked beautifully, the bad news is the snow was very clumpy and there were no pretty flakes to photograph. :( I did notice needles and column snowflakes (see pho to). These kinds of flakes form when the air temperature in the clouds is 28 degrees or above. The pretty dendrite and plate snowflakes form at temperatures around 5 degrees. I hope we will get more snow tomorrow so I can try this again! Since the snowflake photos were not what I was hoping for, I went inside and attached my camera to my spotting scope and took the camera to the basement where I could get next to the window. The kids are not the only little "critters" that go nuts when it snows, the birds were all over the feeder and the ground below it! There were numerous Cardinals, Mourning Doves, Song Sparrows, White-breasted Nuthatches, Black-capped Chickadees, Tufted Titmice, Carolina Wrens, Goldfinches, Towhees, a Brown Creeper, Downy Woodpeckers, Red-breasted Woodpeckers, and even a Yellow-bellied Sapsucker! It was interesting to see some of the birds eating snow from the branches. Later I tried to get photos of a flock of Cedar Waxwings in my neighbors' yard, but they were either too far away up in the top of the tree or they were in bad light. This morning I enjoyed watching the birds at the feeder in the tree behind the house. There were cardinals, Tufted Titmice, Nuthatches, a Carolina Wren, Goldfinches, a House Finch, a Song Sparrow, another sparrow that I couldn't identify, a female Red-bellied Woodpecker and even a couple of Starlings (I wasn't so glad to see them!). I used my spotting scope to get some photos. The woodpecker enjoyed getting the peanuts out of the feeder! Later tonight I went took the scope out to get some photos of the Moon, Venus and some stars. Venus is going to be very bright this month. It is REALLY difficult to try to take a photo of something that is straight up with a tripod and scope! I had to get into some very uncomfortable positions to try and photograph the stars. Then after all that trouble, the photos didn't come out! :( But, on a brighter note, my 1st Quarter Moon photo came out very nice. The craters were very sharp.